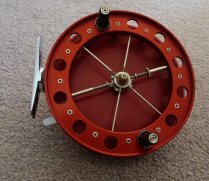 It was a sad day, 19 January 2014, that Fred Crouch passed away, but am pleased to say that manufacture of the current range of these reels will continue. Prices : Following a neccesary review of material (especially nickel-silver) and manufacturing costs in early 2014 there had to be an increase the price of the reels, although it is felt that they still represent good value in today's market. 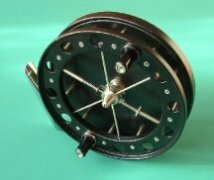 It has found to be not (currently) economically viable to continue manufacture of the less popular natural (anodised) reels, so this option has been discontinued (for the forseeable future). "Truepin Trotter" centrepin - 3.3/4"
3.75" diameter, ratchet lever on rim, but with NO drag. 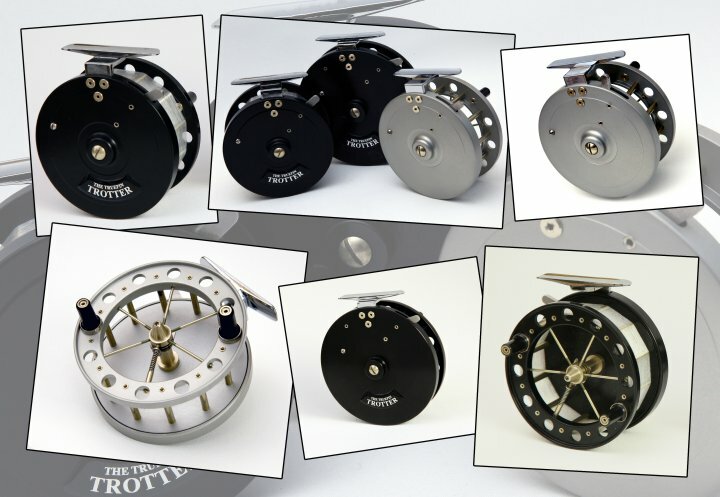 "Truepin Trotter" centrepin - 4.1/2"
"Truepin Trotter" centrepin - 3.3/4" & 4.1/2"
Rods : the "paul4 Barbel Rod "
This rod is built on the GTi blank, which has a clever blend of fibres resulting in a rod with a very sensitive tip, yet with a reserve of power, coping with a huge variety of leads from a single swan-shot upwards, and more than capable of subduing the biggest Barbel. Also ideal for fishing tighter swims, coupled with a c'pin it is perfect for maintaining control of an angry Barbel while minimising the risk of a hook pull. Basically the build of the rod is as specified by Paul (paul4), and is specifically designed for use with a centrepin. Paul built the original prototypes, in conjunction with Roger of Peregrine, and has been testing and using them for 10 years in all situations. Duplicate rods have also been tested by two other centrepin using barbel anglers for over 8 years. The rod is finished in black, and has a full cork handle, carefully shaped at the top end for comfort, and a Wye Button. 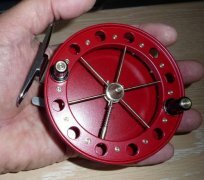 Rings are Seymo 247's and with an extra ring to aid one of the methods of casting. 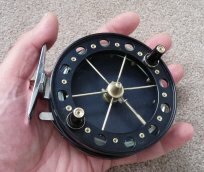 Fitted with a hook keeper, positioned 3" further up the blank than usual, so as to be out of the way when holding the rod for touch legering when bites are delicate.